At 33 kilometers, or about 18 miles, long, Rice Lake is one of Ontario's larger lakes. Vacationers arrived either by steamers or locomotives from the growing urban centers along Lake Ontario to what was one of Canada’s first tourist destinations. 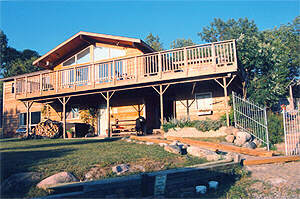 Today the Rice Lake vacation area offers an incredible diversity of attractions for all visitors. The Lake is the main attraction appealing to fishermen, nature lovers, water sports enthusiasts and the many people who simply wish to get away, get some fresh air and sunshine, and just relax. At Rice Lake the old blends with the new. Resorts that originated over a century ago retain their historic charm, while newer resorts have ensured to provide the most modern of conveniences and recreational pursuits. Ever since the days of stagecoaches, steam engines, and paddlewheel steamers, Rice Lake has been a tourist destination Today, Rice Lake offers not just fishing, but many other things to see and do both on and near the lake, and in surrounding countryside and in the area's villages and towns. From canoeing in the solitude of nature, to the excitement of visiting a nearby modern city, the options are more plentiful than other resort districts further away from human activity. Rice Lake got its name from the fact that wild rice once covered the lake stretching down from the north shore in long fingers, in some places almost reaching the other shore. Pioneers saw the Mississaga Indians harvesting the wild rice and processing it into a tasty food, which the pioneers referred to as a form of wild oat, and they too harvested it. This rice made a welcome additional source of food for the winter months. While the raising of the water level and other factors ruined the supply of wild rice, the name has stuck. But some say that if one looks for it wild rice can still be found in the lake's marshy shallows. Rice Lake's history begins with Indian peoples who left behind the famous 'Serpent Mounds' burial area, which can be visited in Serpent Mounds Park south of Keene. By 900 A.D. farming was becoming a way of life, and it laid the foundations for Huron and Iroquoian farms of more recent times. But only the Mississagas, (Algonquian-speaking Ojibwe hunting-fishing people) were visible at Rice Lake by the time European settlers arrived. The Mississagas called Rice Lake Pamadusgodoyong, which means "Lake of Plains". Rice Lake was of special interest to them for its wild rice, deer, and fish. Today those that have an interest in Modern Native culture can visit the Hiawatha and Alderville reserves. The European settlers brought the ancient farmlands back to life and cleared forests to the north. You can see pioneer life recreated at Lang Pioneer Village, just north of Keene. Soon railways and steam ferries were bringing urban populations north, and natural resources south, especially as the Trent Severn Waterway was developed. Finally came roads, automobiles and outboard motors that brought the romantic period of steamers to an end. Today, Rice Lake still contains an essence of its historic times, and many tourist establishments are trying to retain and restore a sense of those earlier times. Rice Lake is a lake with many marshes near its shore, particularly on the north shore near the mouths of rivers such as the Otonabee and Indian Rivers. These areas, which are filled with marsh plants, also harbor wildlife in their unique ecosystems. These places afford plenty of opportunity for the ecologically minded. You can explore to your heart's content in a canoe, as you feel at one with the surroundings.You may even come across some wild rice plants. In recent years there has been a growing interest in exploring nature for its own sake. Rice Lake has numerous shallow marshy areas, which you can paddle a canoe through. Wildlife that you can view includes the Great Blue Heron, the Osprey, and the Loon. "More Fishing per Acre than any other Lake in Ontario." Rice Lake is large and fertile habitat for a wide variety of fish that are sought by anglers -- Large and Smallmouth Bass, Walleye, Muskie, Crappie, and a great variety of Panfish, including: BlueGill, Perch, Sunfish, Rock Bass, etc. Over the years Countless visitors have come to Rice Lake solely for the fishing as a result of Rice Lake’s reputation as a great fishing lake in North America. Rice Lake is very productive in terms of fish. It is said there are more fish per acre here than in any other lake in Ontario. And no matter how much fish is taken out, the supply and the size never seems to dwindle, which makes recreational and sport fishing one of Rice Lake's more notable things to see and do. Not only are there trophy muskie, walleye, and bass (both largemouth and smallmouth) for the sports angler, but the shallows are filled with panfish that are easy for children to catch.Many RLTA cottage resorts on Rice Lake have fishing derbies for children and adults alike and large fish are entered into the popular annual lake-wide 'Big Fish Contest'. The Trent Severn Waterway passes through Rice Lake, and is an ideal place to linger if you are traveling the waterway between Lake Ontario and Lake Huron. Rice Lake is a large lake, about 18 miles or 33 kilometers long, and offers many places to visit and explore. Besides cruising and exploring, there are opportunities at most resorts for sailing, sail boarding, water skiing, tubing, paddle boating, and of course canoeing. Located southeast of Bailieboro on Scriven Rd. off Lakeview Rd. (Cty. Rd.2). The Pengelley Cemetary is marked by an Ontario Historic Sites BoardPlaque commemorating the burial place of Joseph Scriven, composer of the hymn "What a Friend We Have in Jesus". The funeral was held at the home of James Sackville, who lived outside Bewdley on the now Cavan Road, and as Scriven had requested he was buried so that his feet were opposite those of his lost love, Eliza Catherine Roche, that upon their glorious resurrection they might arise facing one another. Did you know that the Rice Lake area is home to some of the most beautiful and endangered plants in North America? While many people are aware of prairies in the Canadian and U.S. mid-west; few people realize that prairies extended as far northeast as the Rice Lake area. You can visit a restored prairie project with a demonstration garden at Rainbow Cottages resort.